Thank you for your loyalty to and participation in activities of IEEE. 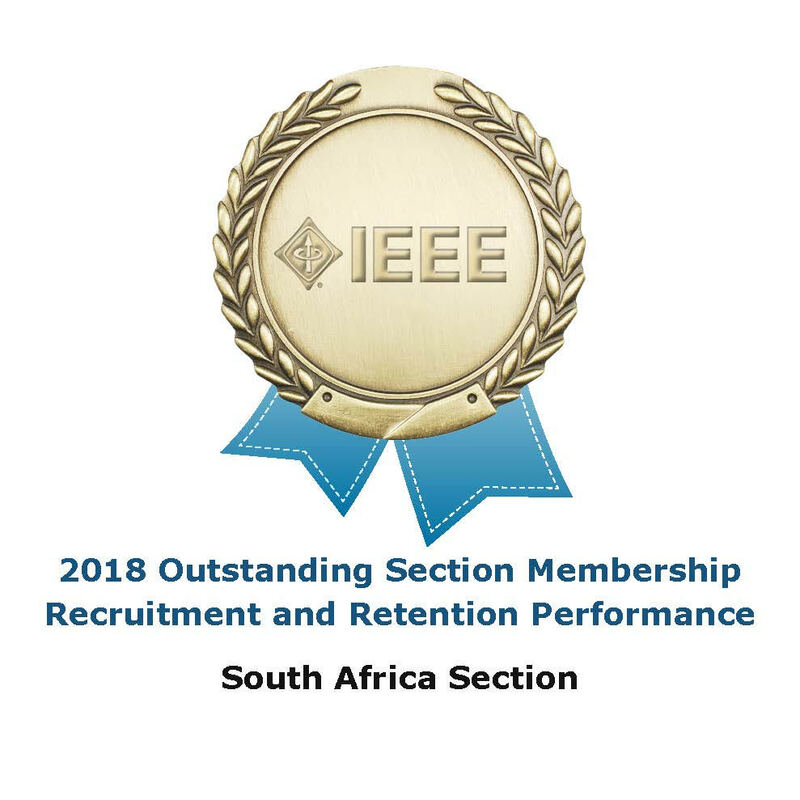 This message is a brief summary of accomplishments by volunteers and members for 2018 and recent updates for IEEE in South Africa. Thanks to the efforts of the volunteers and members, the Section has continued to grow and the Section again received a Gold Award for membership development. The number of events (professional, technical, administrative and nontechnical) offered to members and public has soared from 66 in 2017 to 95 in 2018. The number of IEEE and IEEE supported conferences has increased from 10 in 2017 to 11 in 2018. We gained 26 new Senior Members, as compared to 6 elevations in 2017. New IEEE Student Branch at University of Western Cape (UWC), an initiative led by Andre Henney, Antoine Bagula and Stephanie Agenbag, UWC. and several more units are being prepared. We hosted several Women-In-Engineering (WiE) events, including sessions with over 130 attendees at IEEE Power Africa event, 120 attendees at UCT and over 200 attendees at UKZN. South Africa hosted IEEE Region 8 (Europe, Africa and Middle East) Membership Development workshop, organized by Seyi Stephen Olokede and Albert Lysko. The workshop received Exemplary Service Award from IEEE Region 8. We held a series of “Entering the Real World Workshop” workshops for students in September 2018, helping the students to prepare for professional employment (lead organizer: Darryn). Numerous IEEE Day events have run across South Africa, for the first time after several years (organized by David Oyedokun, Michael Tarerefa, Craig Plaatjes and Albert Lysko). Four South African teams participated in IEEE Xtreme programming competition, for the first time since 2010, executed by organized by Meera Joseph, Wynand Lambrechts, Nwabisa Letsoha, Lindokuhle Shongwe and Philip Strydom. More updates may be expected to come soon, with positions in some of the Standing and Ah-Hoc Committees as well as in Chapters and Student Branches to be filled in. In March 2018, we received the award “Best Section Poster: Best Africa for Africa” from IEEE Region 8 for activities in 2017 and early 2018. 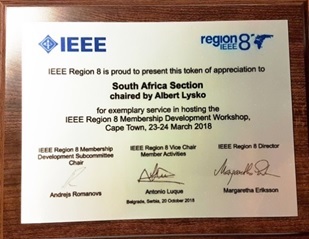 IEEE Region 8 (Europe, Africa and Middle East) Membership Development workshop hosted in Cape Town in March 2018 received Exemplary Service Award from IEEE Region 8 in October 2018. UNISA: significantly increased the number of student members. With sadness, we re-iterate about passing of one of our esteemed volunteers, Prof Hendrick Ferreira. Some information on how to become a Fellow of IEEE is available here. Please note that the current process experienced a bottleneck and some applications are still being processed. Apologies for the delay. We hope to process the remaining applications within the next 3 months. Please remember to renew your membership as the final deadline of February 28, 2019 is approaching. IEEE R8 VCF Grants to attend IEEE conferences for low income students . ECSA Professional Engineer/technologist discounts of up to R1110 for South African IEEE members. Thank you for your contributions to making 2018 so fruitful, once again!